Azure Account key: In Azure blob storage page, there are 2 access keys as shown in below screenshot. You can use any of the keys. Azure Blob Container Name: This is the Azure container which has been created under the Azure account. Extract: Select Email, notes or both. Email foldername: This is the parent folder under which attachment from CRM email will be moved. Minimum files size- only files exceeding this size would be pushed to azure Restrict hard delete- When an email or note is deleted in CRM then the corresponding attachment in Azure is also deleted. If this setting is set to yes then attachments in Azure would not be deleted even if the email/note is deleted in CRM. Valid file types: This consists of semi-colon separated file types. Only attachments having these matching file-types will be moved to Azure. Process emails without regarding: If emails are not tracked against any CRM record…the “Regarding” field of email activity is blank. If this setting is checked then emails without any regarding field will also be processed. 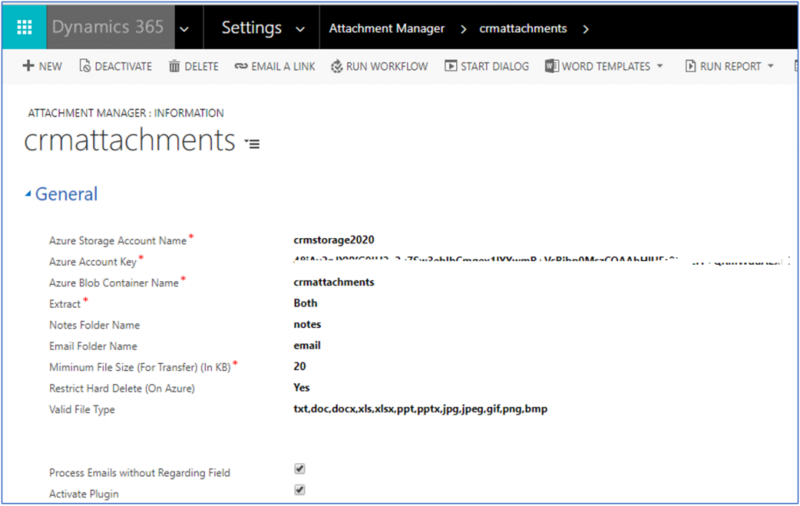 Activate Plugin: If this setting is checked then attachments for emails/ notes will be moved automatically to Azure blob when records are created in CRM. Selected entities: only emails/notes selected will be synced.